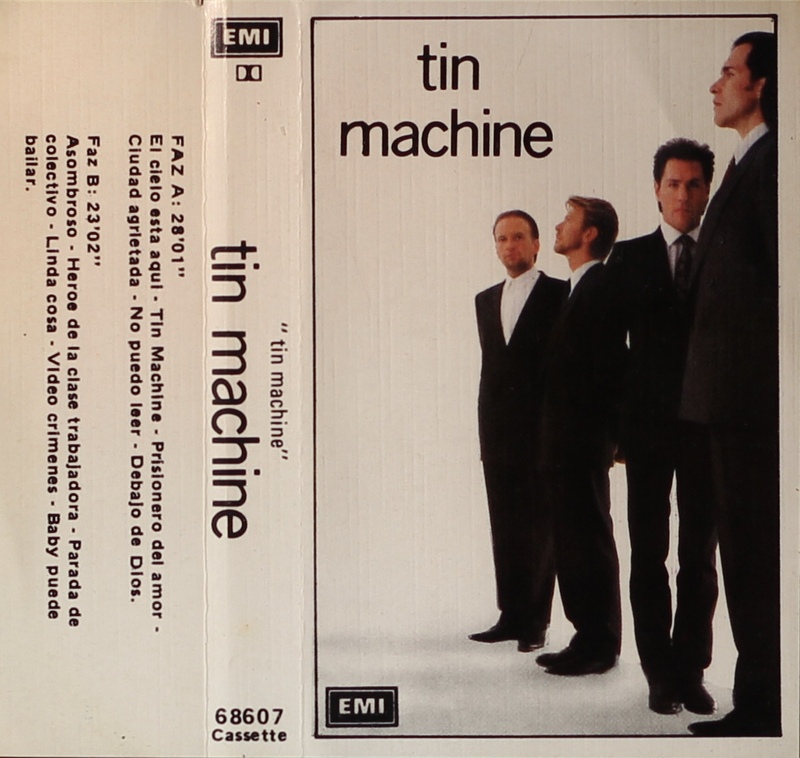 Tin Machine: Argentina; EMI Odeon, 68607; 1989. Full panel picture cover has with thin black border and all white panels on glossy, ‘reed’ patterned paper. 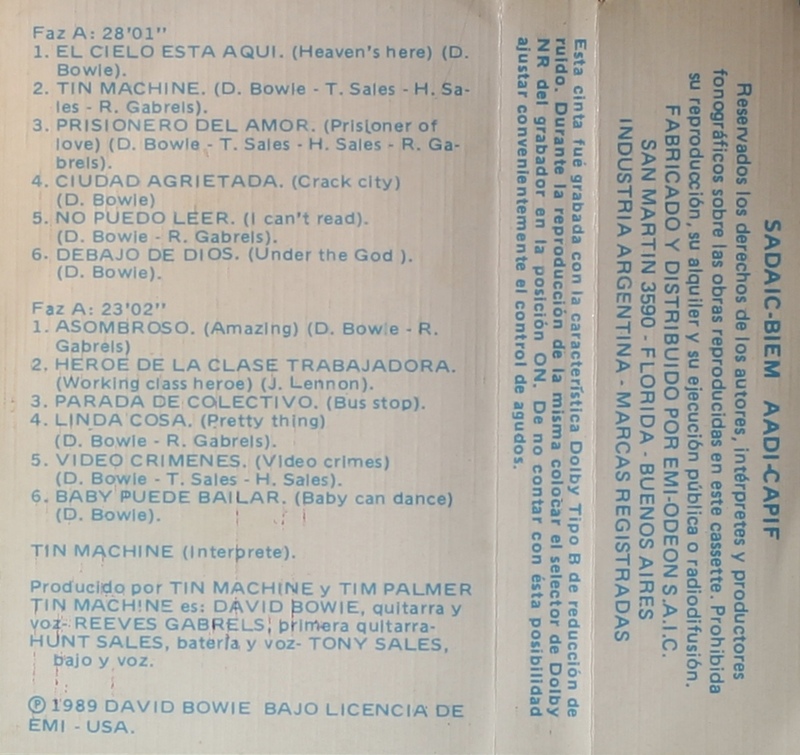 The rear has the track list in Spanish and English and all other information in Spanish, all in blue ink. ‘SADAIC-BIEM’ and ‘AADI-CAPIF’ on inside rear panel and EMI ODEON SAIC Industria Argentina. Comes in EMI stamped case. Track 1 – ‘Heaven’s In Here’ incorrectly titled as ‘Heaven’s Here’. Brown ink printed directly onto white EMI stamped shell. EMI logo lead in tape. ‘SADAIC-BIEM’ and ‘AADI-CAPIF’ on shell. Information and titles in Spanish. 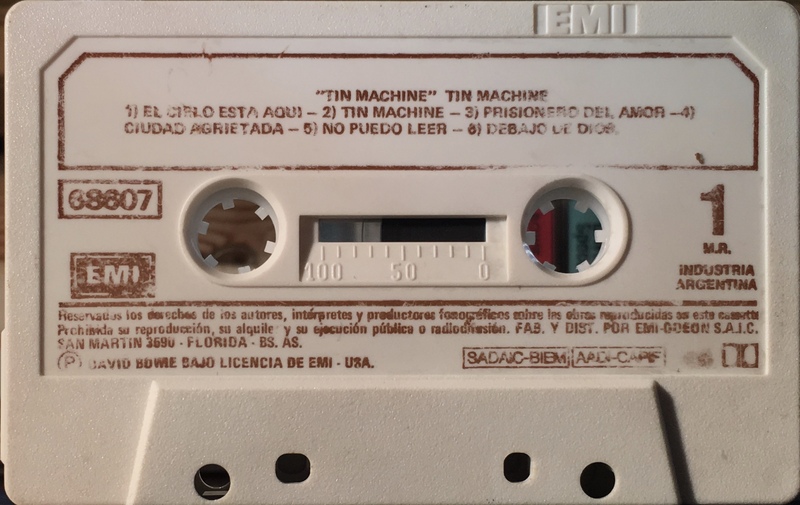 Side 1: El Cielo Esta Aqui (Heaven’s Here); Tin Machine; Prisoner Del Amor (Prisoner Of Love); Ciudad Agrietada (Crack City); No Puedo Leer (I Can’t Read); debajo De Dios (Under The God). 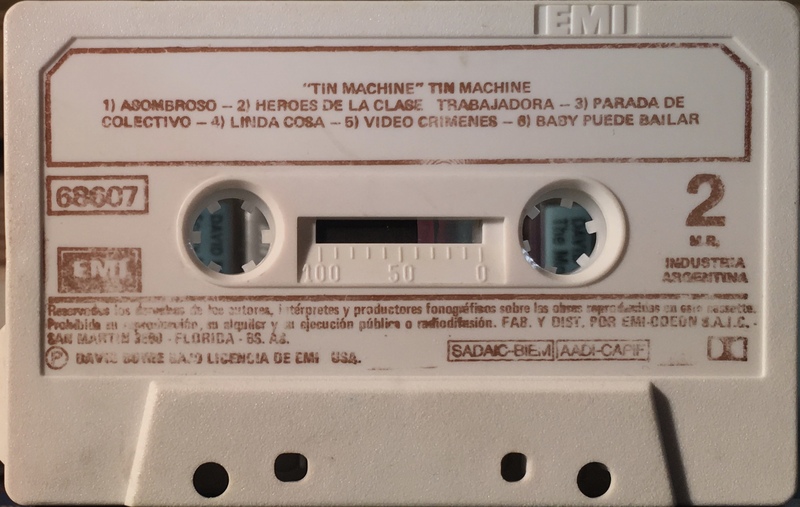 Side 2: Asombroso (Amazing); Heroes De La Close Trabajadora (Working Class Heroe); Parada De Colectivo (Bus Stop); Linda Cosa (Pretty Thing); Video Crimenes (Video Crimes); Baby Puede Bailar (Baby Can Dance).